Introducing David T. Lester, Fingerstyle Guitarist performing in the Northwest Ohio area. FREMONT -- His eyes fixed straight down and zoned in on his guitar strings, David Lester imparted a quick bit of advice for his KidsCollege students. 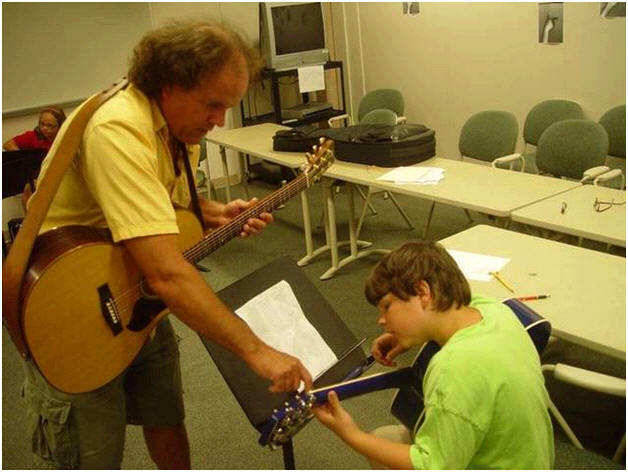 "Remember, chords are to a guitar like words are to language," Lester said, as eight students looked down at their guitars and tried to follow along as the teacher strummed through a slow rendition of Jimmy Buffett's classic hit "Margaritaville." FREMONT -- As temperatures neared 90 in the middle of the day Tuesday, about 25 people gathered under shade trees next to Birchard Library to let cool melodies wash over them. Some unwrapped sandwiches during the lunch hour concert, while others just sat back and enjoyed Helena musician David Lester's acoustic guitar and vocals. 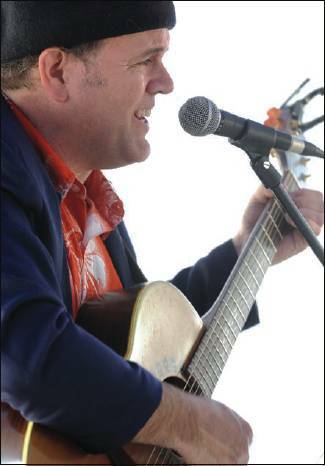 FREMONT -- Acoustic guitarist and Terra Community College faculty member Dave Lester is the featured performer at the next Victorian Tea scheduled for 1 to 3 p.m. Wednesday at the Rutherford B. Hayes Presidential Center's historic Dillon House. Victorian Teas provide an opportunity to experience the popular 19th-Century custom of a leisurely afternoon tea. Lester is a gifted performer who has appeared at numerous area events. He was the first to receive a bachelor of music in Classical Guitar performance at Bowling Green State University. Currently, he is the head of the guitar studies program at Terra Community College, where he teaches Music Business, Classical Guitar Ensemble, Contemporary Music Ensemble, and Recital Attendance. Lester also directs the Terra Guitar Ensemble and Electronic Music Ensemble. In addition to Lester's performance, Victorian Tea guests can enjoy the talents of pianist Tom Hoffert. A native of Fremont, Hoffert provides background music during the tea on the Dillon House's unique square Steinway piano. The elegance of a 19th-century tea is re-created through the use of fine linens and china, delicate tea sandwiches, and delectable tea sweets. Wait staff, dressed in Victorian garb, see to every need. Tea guests are free to explore the Dillon House -- one of Fremont's finest original Victorian-era homes -- or take a stroll through the Spiegel Grove estate of 19th U.S. President Rutherford B. Hayes (located directly across the street). Admission to the Dillon House Victorian Tea is $20/adult and $12/children. Advance reservation and payment is required. Call 419-332-2081, ext. 38. Seating is limited. David Lester’s two-sided business card has a photograph on one side that shows the guitarist in a tuxedo, playing the classical music that’s his first love. The other side shows him in sunglasses and less formal clothing. It’s the way he dresses when he accompanies himself on guitar while singing pop songs by artists such as Jimmy Buffett and Elton John. Lester, interviewed in a coffee shop in downtown Fremont, said he’s learned that if he wants to work full time as a musician in rural Ohio, he has to be open to different ways to use his talents. On Sundays, for example, he plays classical music for a brunch at the Catawba Island Club, then sings and plays pop songs on the outdoor deck at Crabby Joe’s near Marblehead. He also teaches music classes at local universities and gives private lessons to students trying to learn guitar, bass guitar and piano. If you need music for your wedding, he’ll show up, ready to play the “Wedding March.” The farmer’s market in downtown Fremont during the summer? He’s the entertainment. During the Christmas season, he’s very busy performing carols at Christmas parties. And he’s always looking for new ways to develop customers. “I’ve gotten people interested in hiring me to provide music for their Web page,” said Lester, who lives in Helena and maintains a Web site at davidtlester.com. Pointing to a list of businesses he keeps in his notebook, Lester remarks that he’s called a woman at a local tavern six or seven times to ask about performing there. Angie Morelock, executive director of Downtown Fremont Inc., booked Lester to perform at the farmer’s market. Lester, who says he’s been performing music for pay since he was 14, says he wasn’t always so businesslike. If it was up to him, Lester would only play classical music. When he listens to the radio, it’s usually to a classical music station. But he says he’s learned hundreds of pop songs. Later, he remarks that performing Dylan provides a bonus for almost any musician. Dylan is a gifted songwriter and poet, Lester notes. 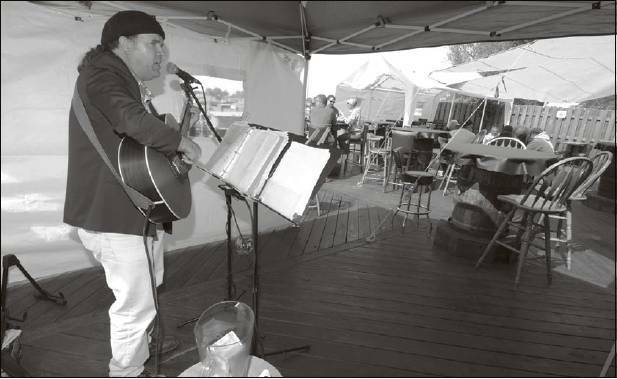 Register photo/JASON WERLING Singer David Lester performs Sunday at Crabby Joe’s near Marblehead. 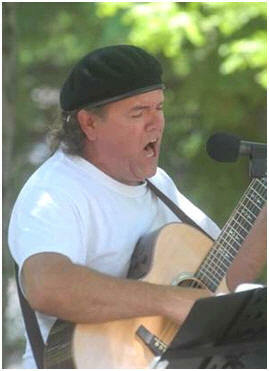 Register photo/JASON WERLING Singer David Lester performs Sunday afternoon at Crabby Joe’s near Marblehead.